CANNIBAL CORPSE recently completed their tour of Russia, a place they have played previously played many times with no issues. Unfortunately, as many Russian fans are already aware, this tour did not go as planned. CANNIBAL CORPSE has released a statement, which can be read below. "A message to our Russian fans:As you all are certainly aware by now, our concerts in Ufa, Moscow, and St. Petersburg were cancelled. We were present in these cities and ready to perform each of these shows but were not permitted to. In Ufa the power was turned off shortly before the show (we were told because the venue was late on rent), and in Moscow and St. Petersburg we were told that we did not have the correct visas and that if we attempted to perform the concert would be stopped by police and we would be detained and deported (prior to the tour we had been told that we did have the correct visas and that all of our paperwork was in order). 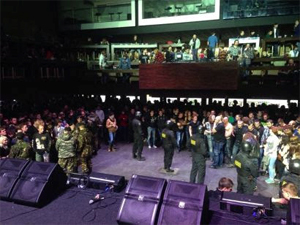 Our show in Nizhny Novgorod also had problems. In that city we performed half of our set before being stopped by police. We were told the police needed to search the venue for drugs and that the show had to be terminated. These are the reasons for the cancellations as far as we have been told. On the brighter side, we had a fantastic time performing in Krasnodar, Samara, Chelyabinsk, and Yekaterinburg. We were able to play our full set in all four of those cities. We came to Russia excited and prepared to play all of the scheduled concerts, and we apologize that we were not able to do so. It was beyond our control. We are extremely disappointed. We have played in Russia many times and we love our Russian fans. Hopefully someday the situation for us in Russia will be different and we will be able to return." CANNIBAL CORPSE recently uploaded a video for “Kill Or Become”, taken from their new album, A Skeletal Domain. The video was directed by David Brodsky for MyGoodEye and was shot on location at Kelly’s Hideaway in Seffner, Florida. CANNIBAL CORPSE released their new album, A Skeletal Domain, on September 16th via Metal Blade Records. The album was produced by Mark Lewis (THE BLACK DAHLIA MURDER, DEVILDRIVER). A Skeletal Domain marks the band's thirteenth full-length. The record heaves forth twelve ill-omened tracks in forty-four skin-searing minutes, the result of which is a colossal, confrontational, and meticulously-executed aural attack that finds the band at the peak of their notoriously hyper-kinetic viciousness.